Over the course of the first few months of 1799, England began to form a Second Coalition. According to the plan agreed upon by the Allies, they would attack France on all fronts to coincide with royalist uprisings in the Republic itself and in the occupied countries. To coordinate these uprisings, the royalist faction in France reorganized itself after the failure of 18 Fructidor Year V. Its new leaders were called the "Souabe Branch". They included General Amédé Willot, who had escaped from French Guiana; General Louis François Perrin de Précy, the former leader of the counter-revolutionaries in Lyon in 1793; and two former deputies, Antoine Balthazar Joachim Dandré (or d'André) and Jacques Imbert-Colomès. The Count of Provence also relied on advice from a "Secret Royal Council" that included Pierre-Paul Royer-Collard and François-Xavier de Montesquiou-Fézensac. His brother, the Count d'Artois, had been prudently kept away from the action. He relied on his own council, certainly more active than efficient, some of whose members were about to depart upon long political careers marked by intrigues and plots (Jean-Guillaume Hyde de Neuville, Jules de Polignac and Louis de Bourmont). The Philosophical Institutes, having survived 18 Fructidor, formed the second tier of the royalist organization. Restructured in 1798-99 by the Abbé de Lacombe and Louis Dupont-Constant, they had adapted their mandate to the new reality. Their plan was to only act in concert and at the opportune time and until then they would establish good relations with all parties, provide the authorities with guarantees and win their trust in order to avoid premature destruction. When the insurrection to end the Republic and restore Louis XVIII to the throne became immanent, they would begin recruiting. The royalist army was made up of sympathizers, often former officers. Its organization, while excellent on paper, was far less excellent in reality. The most active of the Institutes, those of Toulouse and Bordeaux, directed the movement. Beginning in Nivôse Year VI (January 1798), the Institute in Bordeaux was strong enough to organize a demonstration against Colonel Lannes who barely evaded an attempt on his life. As for the Institute of Toulouse, it counted 40,000 members in theory. Though many of its members were inactive, this did not stop it from spreading royalist propaganda or from establishing contact with the émigrés commanded by Count Jules de Paulo who were massed on the other side of the Spanish boarder. The mission of these Institutes was to provoke uprisings in more than half of the metropolitan territory (South West, Vendée, Brittany) to coincide with the Coalition's invasion of the country (in Nice, in the Jura or in Alsace) and with the Anglo-Russian landing in Holland. The date was chosen to be near the end of August 1799. The effect of this inevitable ambiguity was that the simultaneity required to endangered the regime was not achieved; the events occurred in succession. In 1798 and during the first few months of 1799, the Institute in Toulouse was the most active. Police officers, patriots, civil servants and other leading figures in the Haute-Garonne, Ariège, and Lot-et-Garonne were its prime targets. They redoubled their assassination attempts and arson attacks without disregarding more symbolic actions such as destroying liberty trees. Indeed local authorities began to be concerned about the concentration of émigrés, priests, and deserters in the Toulouse region. The Jacobin authorities, taking the situation very seriously, informed the Ministry of Police and demanded reinforcements. They were also aware of the royalists' plans since the unsuspecting Institutes allowed republican generals into their midst. These generals then relayed the information to the authorities. Despite their full understanding of the situation, the Directory only decided to adopt general measures. Faced with a foreign invasion, the government lacked the troupes necessary to act decisively. The insurgents intended to first capture Toulouse and its arsenal in order to arm themselves on August 10 or 12, 1799. This was the date the "Souabe Branch" expected the English and Russians to land in Holland and the Austro-Russian forces to cross the French boarder from the Rhine to the Mediterranean. In reality, the Holland landings would not take place until the end of August and the Austro-Russian offensive would take longer than expected. What is more, the insurgents in Toulouse decided to act prematurely without coordinating with the other groups. The uprising in Toulouse began on August 4, 1799, in Bordelais they waited until the August 15, while the groups in the Vendée and Brittany did not believe they would be able to act until mid-September. Despite the 10,000 men at his disposal who resembled an army, General Antoine Rougé, a former republican who had joined the royalist cause, was unable to capture Toulouse since only 1,000 of them were armed with muskets. Surprised by the energetic reaction of the republican authorities in the city, he had to content himself with a campaign in the surrounding areas. These included Gers (with the notable exception of Auch), the neighbouring part of Lot in the Haute-Garonne and the rural areas of the Ariège. Worse, Rougé and his master, the Count de Paulo who had just arrived from Spain, began to lose control of this territory on August 10, due to the resistance of the local National Guard. They decided to retreat to the Spanish boarder, but came under attack on August 20 and their army was destroyed. By August 25, 1799, the insurrection was finished. In Bordeaux, the news of the events in Toulouse solicited little action on the part of the royalists, but a wave of arrests decimated their numbers and convinced their leaders to flee. The repression that followed was moderate. Numerous arrests often led to many more accusations. The Directory avoided a harsh repression for fear of being outmanoeuvred by their Jacobin allies. More than 4,000, of the 6,000 arrested were liberated, including the Count de Villèle (the future Prime Minister of Louis XVIII and Charles X). This was indicative of the judges' severity. Only 11 rebels were condemned and executed before 18 Brumaire. If the groups in Toulouse and Bordeaux had managed to coordinate their attacks, the Republic would have found itself in a very difficult situation especially if hostilities in the Vendée, Brittany and the Charentes had started up again. The unrest that continued to reign in the West, often deteriorating into daylight robbery (for example, the famous "drivers"), caused the region's civil servant and other leading figures to live in constant fear. Consequently, the cities, where the violence was greatest, were slowly but surely joining with the republican authorities. They were also working to this end. For example, they decided to provisionally delay applying the conscription laws in the western departments. However, royalist propaganda had been so successful at distorting the motivations behind this decision that the Princes believed they were in a position to attempt a new insurrection. The task was given to Georges Cadoudal, Louis de Bourmont and Louis de Frotté. The date was set for the middle of August 1799. However, the 200 royalist leaders in the West did not meet until the middle of September in the château de la Jonchère. It was already too late. The insurrection did not last long in the South West. In Holland and Zurich, Guillaume Marie-Anne Brune and André Masséna had resisted the invasion along the boarder. Napoleon Bonaparte landed in Fréjus on October 9. The beginning of the insurrection was successful. Bourmont captured Le Mans on October 14, 1799 and occupied the city for several days, profiting from the muskets and canons in the city. Nantes was briefly occupied a few days later as well as Saint-Brieuc where the Jean-François Pierre Poulain-Corbion, a former member of the Constituent Assembly, was executed. The republican general Gabriel Marie Joseph d'Hédouville quickly organized a counterattack and was progressing successfully when the Brumaire coup d'état began to spread doubt among the insurgents. Some of them saw in Bonaparte a French version of George Monck (a supporter of Oliver Cromwell who helped to restore the monarchy in England after the latter's death). After 18 Brumaire, a generous amnesty was declared in the South West. The émigrés took advantage of this decision to arm themselves. A small, unlucky number were condemned to deportation and transported to the island of Oléron. On November 24, 1799, Hédouville announced an end to the hostilities in the West with Bonaparte's assent. On December 2, a number of the royalist leaders signed a truce at the château d'Angrie close to Angers. Hédouville declared a general armistice on December 19. Soon after, one of the key royalist leaders, the Abbé Bernier, joined the government. Two other Chouan leaders (the name of a group of counter-revolutionary royalists in the West), Louis d'Andigné and Jean-Guillaume Hyde de Neuville, met with Bonaparte on December 26. Describing the Bourbons as lazy and incapable of leading their troupes into battle and promising for his part to protect the Catholic religion, the First Consul convinced them to change sides. Back in Brittany, d'Andigné and Hyde de Neuville advised the other leaders to negotiate; as many of them did. 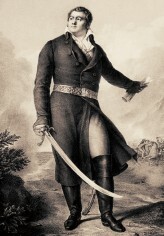 The first to sign the peace accord on January 18, 1800 was Charles d'Autichamp, the Commander of the royalist forces in the Vendée and on the left bank of the Loire. He was followed by the royalist Commander in Le Maine and Anjou on January 20: Pierre Louis Godet, the Count de Châtillon. Suddenly, the royalists in Brittany and the Vendée were no longer able to resist the republican troupes whose number had been increased with the arrival of General Brune and some of his troupes in the West after their success in Holland. Bourmont surrendered on February 4, 1800; Cadoudal on February 14. Frotté was arrested on February 15 and executed three days later. The others each met with the First Consul. Cadoudal's meeting did not diminish his hostility even though he was offered the rank of général de division (major general). Bourmont hesitated for a few years before supporting Napoleon, only to betray him the day before the Battle of Waterloo. These events marked the end of the counter-revolutionary movement. Military conflict was succeeded by plots and conspiracies against Napoleon Bonaparte personally. This website has been designed for a screen resolution of 1280 x 800 pixels. Last update: 2019-03-03 21:31:58.